Fort Sumter, located at the entrance to the Charleston harbor, was built after the War of 1812 as one of a series of forts protecting the southern coast of the United States. On April 12, 1861, South Carolina militia troops at Fort Johnson on James Island fired the first shots of the Civil War at the Union forces occupying Fort Sumter. In December of 1860, after Abraham Lincoln won the presidential election, South Carolina led Southern states in adopting ordinances of succession. A few days later, US Army Major Robert Anderson moved his troops from Fort Moultrie to Fort Sumter, hoping to delay an attack by South Carolina militia. By the time Lincoln was inaugurated in March of 1861, six other states had joined South Carolina in seceding from the Union. The seven wrote a new constitution and formed the Confederate States of America, establishing their temporary capital at Montgomery, Alabama. At the same time, governors in Massachusetts, New York, and Pennsylvania quietly began buying weapons and training militia units. Tensions were clearly building toward confrontation. In April, multiple requests by South Carolina’s Governor for Major Anderson to abandon Fort Sumter had been repeatedly ignored. South Carolina militia troops, under the command of Brigadier General Beauregard, gathered in readiness across the harbor at Fort Johnson. The US Army sent heavily defended war ships to restock supplies at Fort Sumter. When the first US ship arrived on April 11, Beauregard’s aides Colonel James Chesnut, Captain Stephen Lee, and Lieutenant A. R. Chisholm visited Major Anderson at the fort to once again, demand a surrender. Though Anderson deliberated, ultimately he refused and Chesnut, Lee, and Chisolm returned to Fort Johnson and reported his answer to Beauregard. 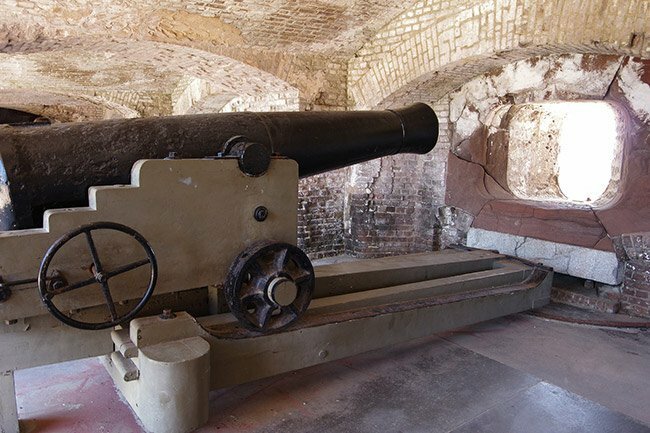 At 4:30 AM on April 12, Confederate soldiers began to fire their cannons at Fort Sumter and they kept up the bombardment for 34 straight hours. Federal troops returned fire, but were ineffective. On April 13, the fort was surrendered and evacuated.The people of Charleston could see the battle taking place across the harbor. Naive to the ruin that would come, they believed the conflict would be short-lived. A famous diary of Mary Chesnut described a festive atmosphere along what is now known as The Battery with residents watching from their balconies and raising toasts to the beginning of the hostilities. The Confederacy held Fort Sumter until the very last months of the war, finally surrendering it to the Federal Army in February of 1865. Repairs were made to the structure after the war ended, but between 1876 and 1897 it was used only as an unmanned lighthouse station. Each time America went to war in the ensuing years, reconstruction was done to make Fort Sumter battle-ready. At the beginning of the Spanish American War, a new concrete blockhouse-style installation was built inside the original walls. Rifles were mounted during WWI and antiaircraft guns were installed during WWII, but the fort never saw combat again. Fort Sumter became a United States National Monument in 1948. 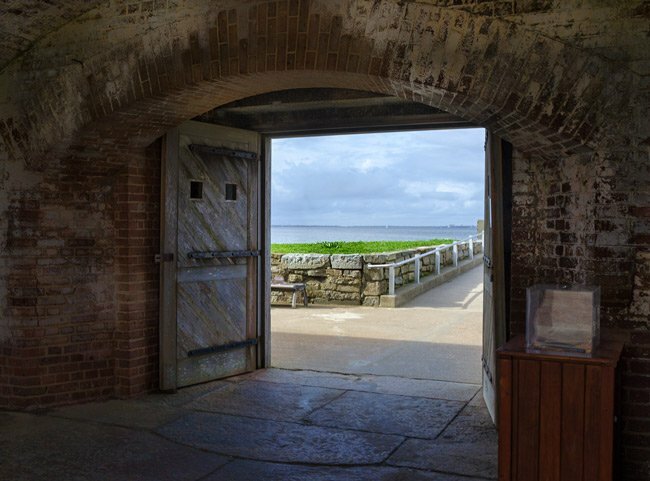 A short ferry ride from Charleston, the historic fort is open daily to the public. 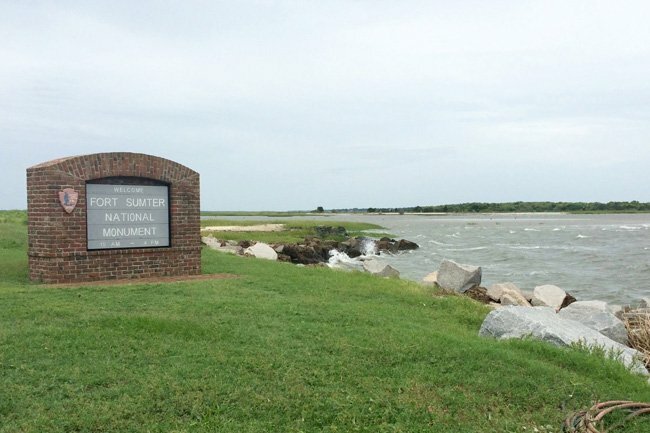 For more on visiting, go to the Fort Sumter Visitor Education Center. Special thanks to photographer Barry Gooch of Charleston for sharing his photos, including part of his collection of historical photos, with the South Carolina Picture Project. Also, thank you to Larry Gleason for contributing his stunning aerial photos. 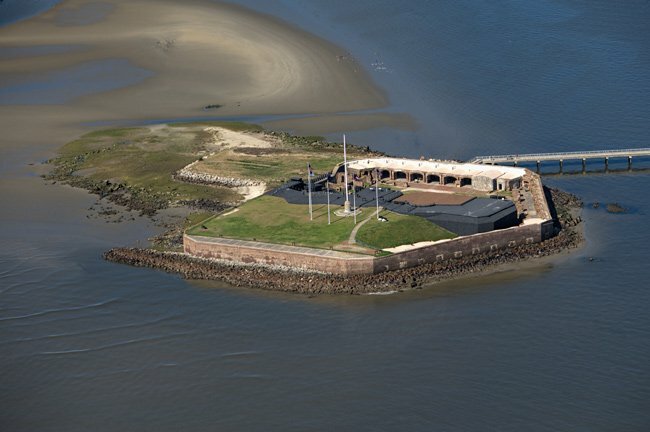 Perhaps no area in America embraces the evolution of harbor fortifications as well as Fort Sumter National Monument, which includes both Fort Sumter and Fort Moultrie. 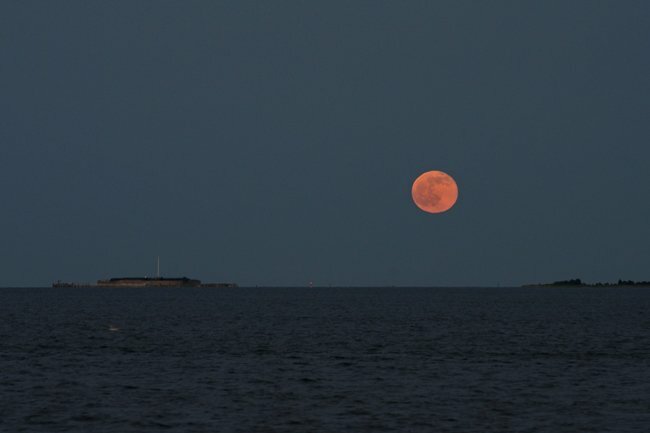 Strategically located at the mouth of Charleston Harbor, the first Fort Moultrie was the scene of a victory on June 28, 1776 that prevented the British from quenching the American Revolution in its early stages. The second Fort Moultrie occupied almost the same site from 1794-1804 as war clouds in Europe posed numerous threats to America. 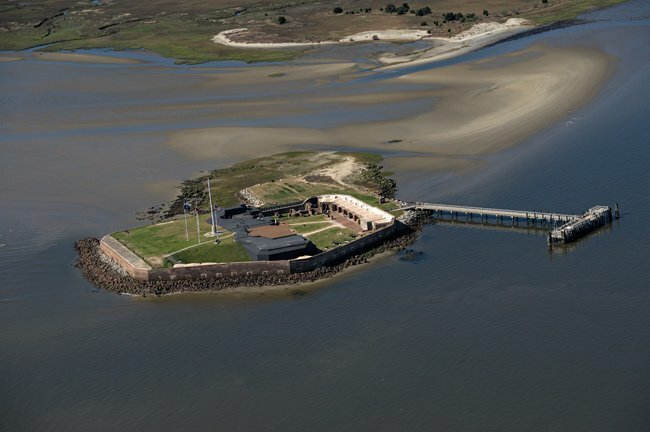 The third Fort Moultrie, completed in 1811, played its most significant role during the Civil War. On December 26, 1860, Union Major Robert Anderson evacuated the fort to occupy the new Fort Sumter one mile southwest in Charleston Harbor. 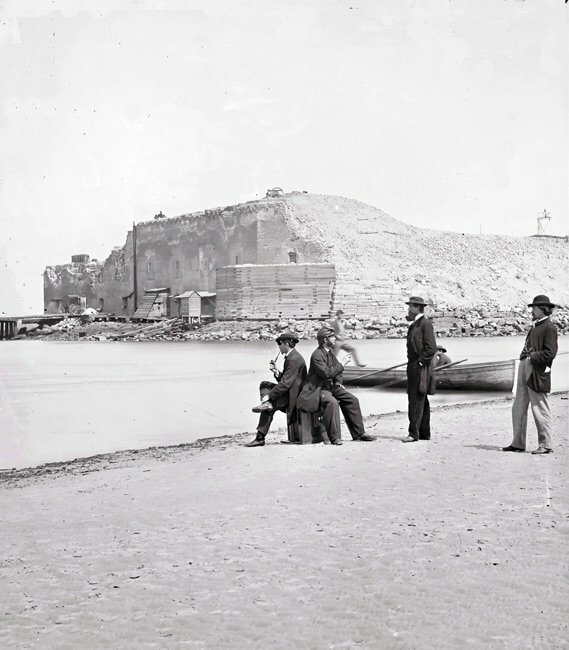 Fort Sumter was built as a defensive counterpart to Fort Moultrie. The guns at Fort Moultrie helped drive Major Anderson out of the fort during the opening of the Civil War, April 12-13, 1861. 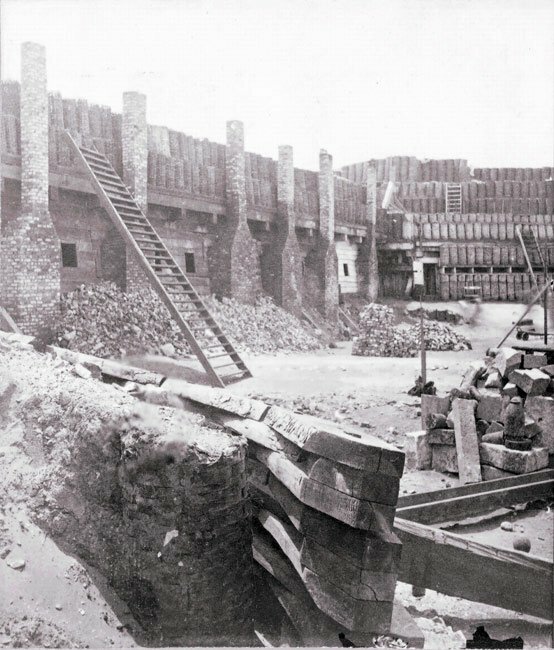 As the symbol of secession and Southern resistance, Fort Sumter was heavily damaged by Union rifled guns in 1863-1865, which signaled the end of obsolete masonry forts with many guns. 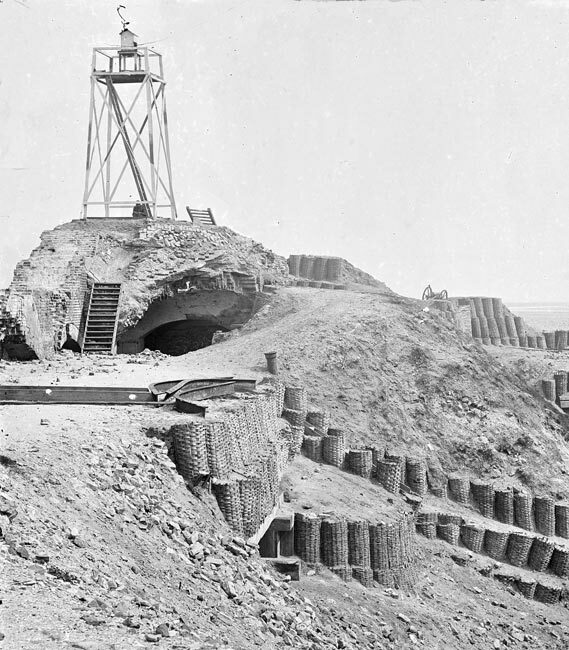 During rehabilitation of these forts in the 1870s, larger guns were spaced further apart, powder magazines built underground and closer to the guns. Batteries Jasper and Huger were built in the Spanish-American War era. These huge concrete structures could withstand the more powerful naval armament. To protect minefields, smaller batteries such as Bingham, McCorkle, and Lord were developed. In World War II, the logical culmination in the evolution of harbor fortifications was the employment of electronic detection equipment of the Harbor Entrance Control Post with nearby defensive guns. 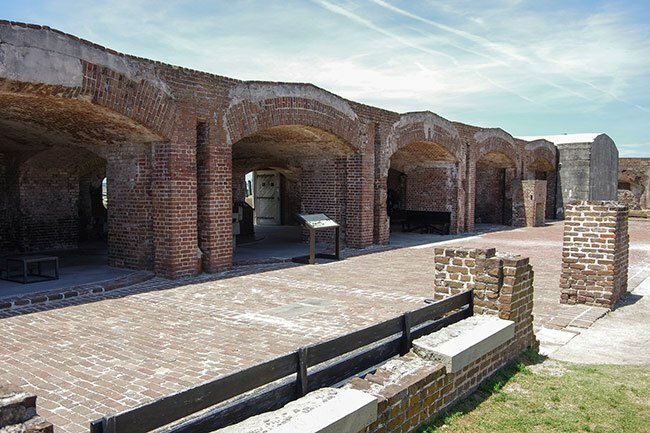 The structures of Fort Sumter National Monument, whether large or small, have played a substantial role in safeguarding the Charleston area through nearly 200 years of history and seven wars. Is it possible to get the names of soldiers stationed at Ft. Sumter during WWI? I believe my grandfather was stationed there, Edmund Joseph Ryan, and married my grandmother, Francis Jones. Is it possible to get the names of soldiers stationed there during WWI? I believe my grandfather Edmund J Ryan was there and married my grandmother Francis Jones.